By far one of the coolest demos so far. I don't have an xbox 360 controller so it's a tad clunky with a keyboard, but he mentions bringing in mouse support down the line so we'll just sit tight. The HUD totally reminds me of Interplay's Descent (1995). 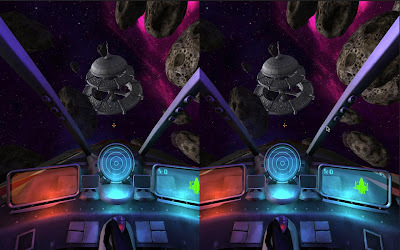 Motion sickness is minimal, making me think that space simulation games like this will be a real winner for the early oculus crowd. I really wanted to see that joystick move in parallel with your actions (tilt & pan). For added fun play some dogfighting tracks from Eve Online (http://www.infinitelooper.com/?v=k3zohj9NKXE) at the same time. Just tried this out with my new joystick -- amazing! !